The era of the Great Crusades encompass two periods in the art in Europe. It spans the end of the Romanesque style and the beginning of Gothic art, the former ending around the middle of the 12th century. Romanesque architecture was a combination of features from Roman and Byzantine structures characterized by heavy, round-arched churches. Romanesque churches had thick walls, close-set columns, and small windows. 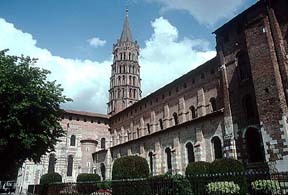 St.-Sernin Church in Toulouse, France was a Romanesque pilgrimage church. It was built along the roads leading to the Santiago de Compostela pilgrimage center in northwestern Spain. Designed to accommodate large crowds of lay worshipers, it has a long nave and transept. The vaulted nave eliminated the hazard of fire that was a common problem with the wooden roofs of earlier churches. The design of the church is a Latin cross. It was during this period that the Christian church donned the role of the militant leader. It was the duty of the church to fight the dark powers on earth until the end of the world as described in Revelations. The crusaders became representatives of this militant church as they set out to seize Jerusalem from the Muslims, claiming this Holy City in the name of Christianity (Gombrich, 120). The art, architecture, and furnishings of the church all reflected this viewpoint--most characteristically, the sculptures. The tympanum at the church of La Madeleine at Vezelay represents The Ascension of Christ and the Mission of the Apostles. This representation relates to the scripture story of Acts 1:4-9 in which Christ tells the Apostles that they would receive the power of the Holy Ghost. He then told them that they would become the witnesses of the truth of the Gospels throughout the world. The rays of light extending from Christ's hands signify the coming of the Holy Ghost. The apostles below Christ are receiving their assigned tasks: to save; to condemn; to preach the Gospel to all nations; to heal the sick; and to drive out the devils (De La Croix, Tansey, and Kirkpatrick, 370). The tympanum contains illustrations of these tasks. The overall picture of the tympanum emphasizes the greatness of God in relation to human beings. It was from La Madeleine at Vezelay that Bernard preached the Call to the Second Crusade. It was also from Vezelay that King Richard the Lion-heart of England and King Philip Augustus of France set out on the Third Crusade. The Crusades were believed to be a second mission of the apostles, to convert nations to the word of the Gospels. In the West, during this period there was a revival of monumental stone sculptures, which had previously been absent since Roman times. Romanesque sculpture, most commonly carved in relief, was an integral part of the architecture to the church that it belonged. 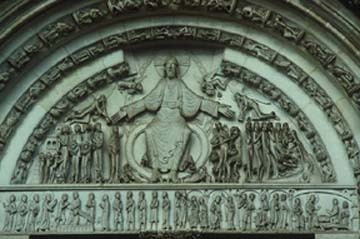 In the abbey of the Moissac church in France, this tympanum illustrates the Apocalypse, the second coming of Christ. The purpose of its design was to remind its onlooker to prepare his/her soul for Christ's second arrival on earth. This sculpture, and others like it, appealed to the lay worshipper rather than to members of a closed religious community. Personal emblems clearly marked all the sculpted figures so the faithful could understand the meanings and messages implied by the artwork (Piper, 70). The desire to present clear messages was also present in illuminated manuscripts. The artists did not concern themselves so much with an imitation of natural form in these manuscripts as much as with the arrangement of traditional sacred symbols. The symbols allowed the artists to depict the stories without illustrating actual scenes from them. This illumination from the Gospel Book of Abbot Wedricus, entitled St. John the Evangelist, shows conventional emblems placed around the figure of St. John. (The right hand extended in a gesture implies that the character was speaking.) The donor of the manuscript, Abbot Wedricus, is supplying the ink for the figure of St. John. The hand of God holds the dove, the traditional symbol for the Holy Spirit that serves as St. John 's inspiration. The eagle is the identifying symbol of St. John himself. The other circular pictorials show scenes from St. John's life (Janson, 296). In illuminated manuscripts, the artists could dispense with the mandates of natural illusion and space and arrange the figures and forms in a purely ornamental fashion. The portrait was virtually non-existent throughout both the Romanesque and Gothic periods. Artists would work from a conventional figure and add insignias of office such as a scepter or a crown for a king, sometimes writing the names beneath the drawing. Artists widely used the conventi onal figure or symbol. They would work from patterns. Aspiring artists would first study as apprentices with artists learning these symbols. There were not many celebrated artists at this time because they wished to give glory to the work instead of to themselves. Beginning around 1150, the styles changed and formed what historians later termed the Gothic period. This change is characterized by a synthesis of religion, philosophy, and art. Most representative of the Gothic city are the soaring cathedrals. The meaning of the word cathedral is "bishop's throne." 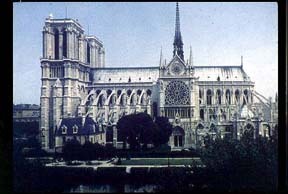 The Gothic cathedral consisted of flying buttresses, stone beams extending from the walls. These beams took the weight of the building off the walls. Therefore, the walls could be thinner, allowing space for stained-glass windows. Most characteristic of these cathedrals were the narrow pointed stone arches extending from tall pillars. These arches allowed the architects to build higher ceilings than the rounded arches of the Romanesque period, thus producing more open interiors. The development of these exterior buttresses also created large open spaces in the interior. These new dimensions deleted anything human and petty in the minds of the people who entered the cathedrals. They brought the minds of the people from earthly concerns and raised them towards the sky to heavenly matters. The people regarded the cathedrals as the real images of the city of God; the Heavenly Jerusalem represented on Earth. Revelations XXI describes the Heavenly Jerusalem as having gates of pearls, priceless jewels, streets of pure gold and transparent glass (Gombrich, 134). The magnificence of the cathedrals in combination with the intricate stained glass symbolized this Heavenly Jerusalem. For the people of the thirteenth century, these cathedrals acted as symbols of their faith. Cathedrals were the main source of work for northern sculptors in this period. The sculptures recaptured the Roman style of showing the form of the body underneath the drapes and capturing facial expressions. The artists were no longer interested simply in what they represented, but in how they represented it. They wished to tell these religious stories in a manner that was both more convincing and that bore more emotional impact. This more natural form is evident in the sculptures of the Saints on Notre Dame's West Transept Portal. The gestures have more variances, and the faces have more expression. These sculptures possess more relaxed poses, and the form of the body is evident underneath the drapes. These sculptures give natural human qualities to the Saints -- qualities that the artists had previously portrayed in pattern form. In the thirteenth century the most frequent tasks of the northern painters were illuminated manuscripts. Yet, the artists of this century chose to show the feelings of the figures. They focused more on the expression of the intense feelings of the characters than on the placement of traditional sacred symbols. The distribution of the figures on the page was more important than life-like figures or the representation of real scenes. Perfection by an Islamic artist could only be acheived with the aid of inspiration from God. The craftsman's achievement was dependent not on his own ingenuity, but on his devotion to the task and his closeness to God. Islamic sculpture could not depict human figures. Muhammad forbid the making of images; they represented idolatry and a human presumption that man can replicate the human form as God had. Yet only God can generate souls into living creatures. Some theologians believe that this avoidance along with the retreat from the use of religious symbolism stemmed from a conscious rejection of Christian customs practices. Instead of images, the artisans used geometric and floral patterns and forms, arabesques. Islam chiefly retained this restriction, though, for large scale art for public display. The constraint did not carry over into small every-day items, since these personal items did not pose a public threat to the religion. Rugs, fabrics, pottery, and small human and animal figures did survive in Islamic art. Artists normally used the figures for simple decoration; they held less importance than the typical abstract patterns. The people of Islam enjoyed portable, lavishly decorated objects, stemming from their nomadic heritage. Many of these objects could be found in the churches and palaces of western Europe as a result of trade or from the plundering of the crusaders, who admired the ingenious workmanship. An example of one of these spoils is the embroidered coronation cloak of the German emperors. Islamic artists in Palermo made the cloak for Roger II of Sicily in 1133-1134. It is made of red silk with gold embroidery. It has a width of eleven feet and two inches. The symmetrical grouping of the two lions attacking camels on either side of a symbolic tree of life is a theme dating back thousands of years in the ancient Near East. Here, the animals are inscribed with quarter-circles and filled with ornamentation. A sense of pattern detracts from the original ferocity of the animals (Janson, 251). Islamic woven silk textiles were much appreciated throughout Europe. Many of them have survived because they were used for Christian clerical vestments and for wrapping the relics of the saints. Spain was the leading producer of textiles, and its port served as a common stopping-point for Christian ships. In this Bicephalic bird silk, of which only portions remain, the birds have bodies and wings that are patterned in sections. Each bird is framed by the top and bottom arc of circular medallions. The sides of the medallions open into each other giving the effect of scalloped borders above and below each row of birds. This design provided the model for the painted ceiling in the crypt at the cathedral of Clermont in France (Ettinghausen, 159). Little painting has survived from Islamic art. Much of the style of the art was the result of the work of artists of other religions. Occasionally, Arab rulers imported Byzantine artists to paint in the styles of Islam. There was a constant demand for the illustrations of scientific texts. For example, the Dioscorides' De Matena Medica is an illustration of the Greek physician Erasistratus on a couch talking with an assistant. Both of the figures have haloes--a characteristic taken from Christian art. Illuminated manuscripts often had images of men and women, but only as illustrations about Islamic rulers. These figures were most often drawn without reference to an underlying bodily structure. In all Islamic manuscript painting, the emphasis was on the outline. Scribes executed some of the illuminated manuscripts. A skilled calligrapher might draw a picture of the text. These would be pen-drawn illustrations and would mainly appear in secular Arabic literature. A Digitial Archive of Archicture: Romanesque Page. A collection of slide compiled by Jeffrey Howe of Boston College. http://www.bc.edu/bc_org/avp/cas/fnart/arch"
Brommer, Gerald F. Discovering Art History. 2nd ed. Worcester: Davis Publications, Inc., 1988. De La Croix, Horst, Richard G. Tansey, and Diane Kirkpatrick. Art through the Ages. New York: Harcourt Brace College Publishers, 1991. Ettinghausen, Richard, and Oleg Grabar. The Art and Architecture of Islam: 650-1250. Middlesex: Penguin Books, 1987. Folda, Jaroslav, ed. Crusader Art in the Twelfth Century. Oxford: BAR, 1982. Fox-Friedman, Jeanne. "Messianic Visions: Modena Cathedral and the Crusades." RES 25 (Spr 1994): 77-95. Gombrich, E. H. The Story of Art. New York: Phaidon Publishers Inc., 1968. Janson, H.W. History of Art. 3rd ed. New York: Harry N. Abrams, Inc., 1986. Piper, David. The Illustrated History of Art. New York: Crescent Books, 1991. Weiss, Daniel H. "Biblical History and Medieval Historiography: Rationalizing Strategies in Crusader Art." MLA 108 (1993): 710-737. Weitzmann, Kurt, et al. The Icon. New York: Alfred A Knopf, 1982.